Who's a Slow Cooker For? How Much Space Does A Slow Cooker Take Up? Lives are busier now than they have ever been, with our focus increasingly forced away from hearth and home. Meals are a rushed afterthought, grabbed on the way home from work and microwaved, or ordered from our local takeout. It's unfortunate, but a fact of life – we don't have time to cook anymore. Unless, of course, you invest in a slow cooker – fill it up with a hearty stew, spaghetti Bolognese, or even a roast joint, put it on in the morning before you head out the door, and when you get home you'll walk in to the enticing aroma of nutritious, well-cooked food, just waiting to be served up. 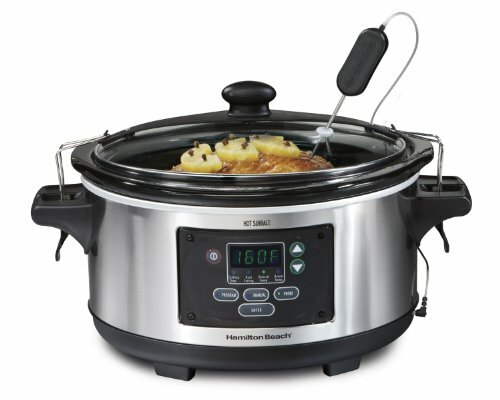 The following reviews should help you choose the slow cooker that's right for you and your lifestyle. 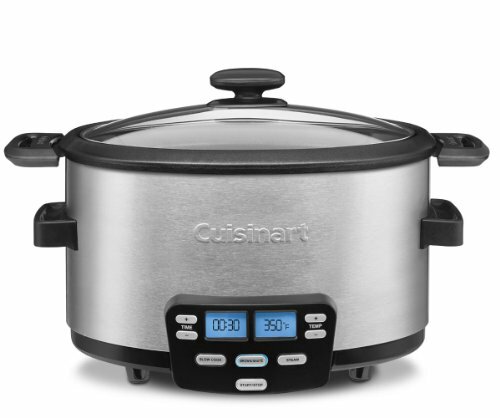 The Cuisinart MSC-400 offers an extra-large, blue backlit LCD display, for easy visibility, and comes with a tempered glass lid, so you can easily do a visual check on your meal, as well as cool-touch handles, so it's no trouble at all to carry the whole thing to the table, if you're doing a pot-luck supper for friends or family. Unfortunately, the MSC-400 isn't dishwasher safe, although cleaning is a fairly easy job, and we found that the button identification (being simple peel-and-stick labels) comes away quite easily after a few uses, meaning you either have to have a very good memory, or be confident with guesswork. The MSC-400 also includes a steaming rack and instruction book. From Hamilton Beach, the Set 'N' Forget comes with a clip-tight gasket lid to help reduce spills, full grip handles for safe movement, and a thermometer probe, so you can be sure your food is properly cooked right through. The Set 'N' Forget will auto-switch to a “keep warm” function once food has been fully cooked, so you literally can just put it on, go out, and forget about it – no need to worry about whether you put it on the right heat setting before you left! In our opinion, this slow cooker is somewhat heavy for the elderly or infirm to lift, and we were a bit concerned about how hot the exterior becomes during use. On the whole, if it is simply being put on a counter-top and left there, with nothing close to it, the Set 'N' Forget is an ideal slow cooker for those with busy lives who don't want to let healthy eating and proper meals slide. It is also easy to clean. 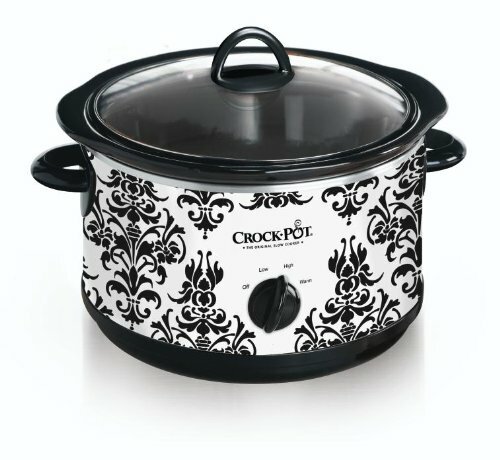 The Crock Pot SCR450-pt-4 ½ comes in an attractive black and white damask design, with a range of matching accessories available, making it ideal for the stylish, contemporary kitchen. It has a tempered glass lid, and the inner pot is removable, and dishwasher safe, making it very easy to clean. However, it can struggle to heat food to the appropriate level if it is just left – considering many people purchase slow cookers because they're at work all day, this is a significant drawback. The Fagor 670042050 Lux multi cooker offers slow and pressure-cooker functions, as well as yogurt and rice functions, for the full range of healthy convenience. It comes with a recipe book and user manual included, and a dishwasher safe removable inner pot, for easy cleaning. The main drawback for the Fagor is that it can't be left for long periods, as the timer can only be set for 99 minutes at a time. This means that the Fagor isn't really suited to people who are looking for a slow cooker that they can load up and leave whilst they're at work during the day, for example. 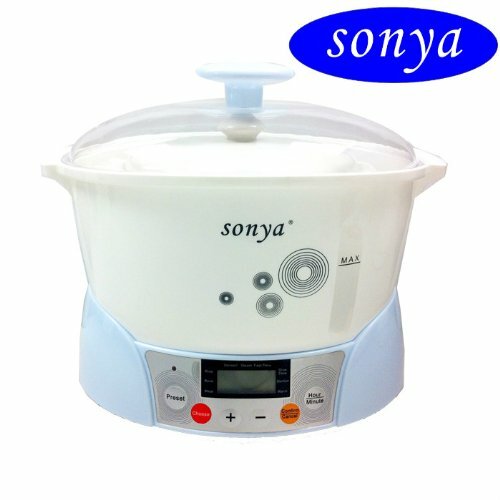 Finally, the Sonya Electric Ceramic Slow Stew Pot is a good, simple to use, easy clean slow cooker, which is ideal for someone living on their own who just wants a basic slow cooker. The Sonya offers micro computer controlled temperature, and an easy-to-read LCD display, meaning it is intuitive and simple to use. However, being ceramic, the Sonya is not dishwasher safe, although it is easy to clean manually. Is A Slow Cooker Just For People Who Work? Although ideally suited to people who are out of the house all day, a slow cooker also comes in handy when you have friends or family over, and want to spend time with them, rather than in the kitchen, or for people who live alone, and don't want a lot of hassle when it comes to meal preparation. Slow cookers can also be a good option for people with busy families, where family members are all coming in at different times – you can set the slow cooker up in the morning, and people can simply help themselves when they get home. A slow cooker is also an excellent gift to a young person heading off to college for the first time, and can alleviate a lot of parental anxiety over whether their child will manage to get healthy, nutritious meals while they're busy studying and, as is the case for many students these days, holding down part-time jobs, too. Finally, for those on a budget, a slow cooker is a great investment, allowing you to cook cheaper cuts of meat in a way that ensures they actually taste good, or to prepare vegetable-based dishes without risking them turning to mush by the time you get in from work. Slow cookers typically have quite a small footprint, and they come in various sizes, so it's easy to find one that suits your circumstances – if you're living alone, or as a couple, in a small apartment, for example, a slow cooker will take up at most the same amount of space as a microwave, whilst offering a healthier, broader range of meal options. Conversely, if you have a large family and a big kitchen, you can choose to invest in a larger slow cooker, which will easily hold enough for everyone, but again, not take over your counter space. As more and more people move away from the traditional large roast forming a central part of their main meal, slow cookers may well come to replace traditional ovens as a kitchen essential.